Boot and Kyle Miller kindly invited me to join them on a winter trip into the northeast side of Mount Rainier National Park. 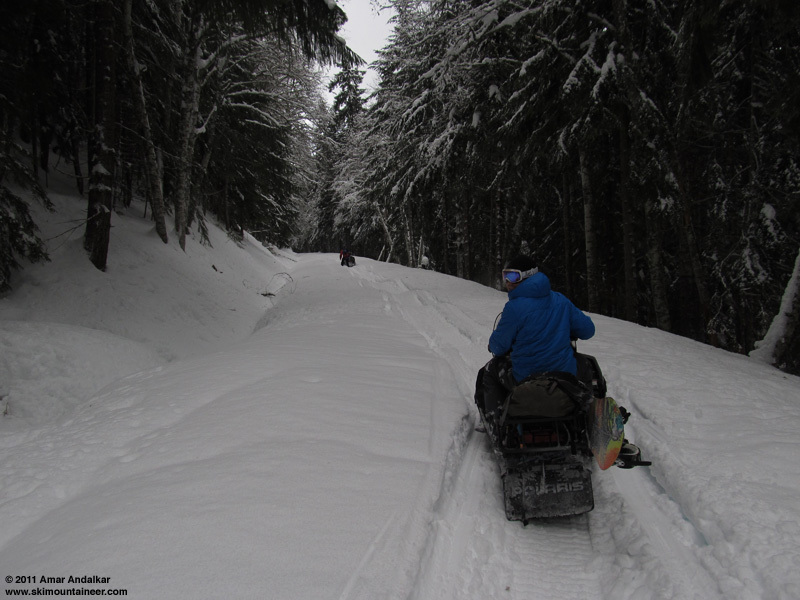 The roads on this side of the park are closed in winter, but "snowmobiles are permitted on the 12-mile section of unplowed road from the north park boundary on Highway 410 to the White River Campground." However, it's not easy travel and no effort is made to keep the road accessible to snowmobiles -- in fact quite the opposite, as the roads are not groomed, and the 4.5 miles of SR 410 from the park entrance to the White River junction is currently plowed 1.5 lanes wide, leaving only a narrow path for snowmos along one side. The White River Road is difficult going too, with 2-3 ft deep powder filling and masking the old snowmobile rut, and nearly blocked by a 3 ft diameter fallen tree, which has an underpass dug through the snow beneath it. An easy section of the White River Road. The previous afternoon's Rainier forecast called for "mostly cloudy, a few sun breaks, a chance of afternoon showers", and that would turn out to be very accurate. 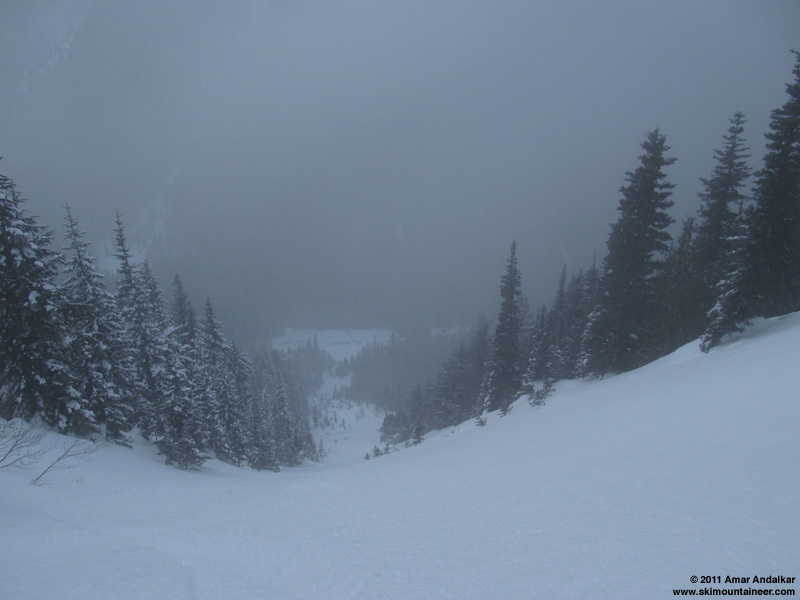 We started from Silver Springs Sno-Park (2750 ft, at the start of Crystal Mountain Blvd) in some light flurries, but there would be a few sun breaks throughout the morning and early afternoon, before steadier snowfall moved in. It took about 45 minutes to ride the 9 miles in to the Fryingpan Creek bridge (3800 ft), and another 45 minutes to dig out the two snowmobiles which each got stuck separately wallowing in the deep powder just before and after either end of the bridge. 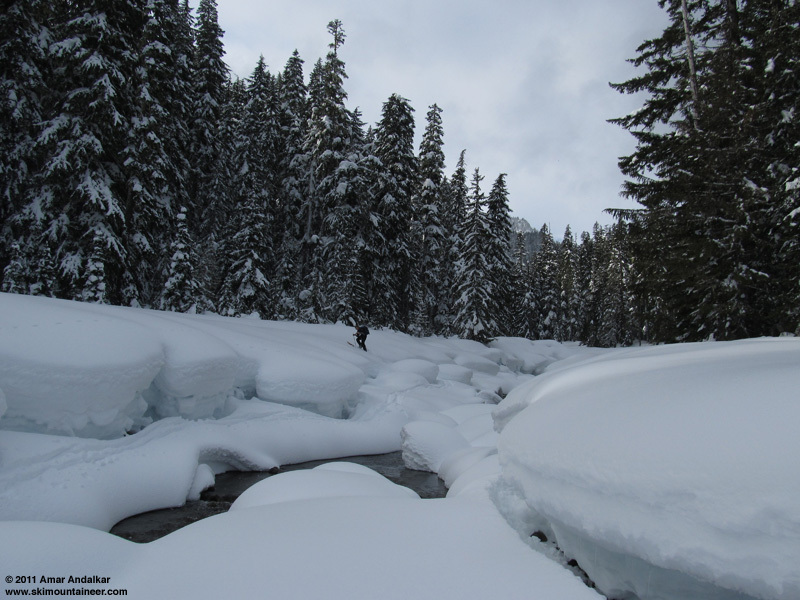 Snowmobile access is certainly no walk in the park here, but it does make these areas of MRNP accessible in winter as day trips, without the tedium and drudgery of 9-12 miles of up-down road skinning with heavy overnight packs or pulling sleds. Boot finding an easy crossing of Fryingpan Creek. Kyle and Boot had been in here the day before (see other TR), parking the snowmos a couple miles farther back (to avoid getting stuck) and breaking trail on splitboards in deep powder up the road and through the woods for many miles. Up the Wright Creek drainage from Fryingpan Creek, into the basin and cirque of the main lobe of the Sarvant Glacier and then to its head at a 7000 ft col just east of 7400 ft Banshee Peak. The plan for today was to follow the existing skin track to the top of the glacier and then see what extended touring and skiing options the weather would allow. Kyle looking up at the Cowlitz Chimneys, from where the basin opens up above 5000 ft. Approaching the top of Sarvant Glacier, with Banshee Peak at right. 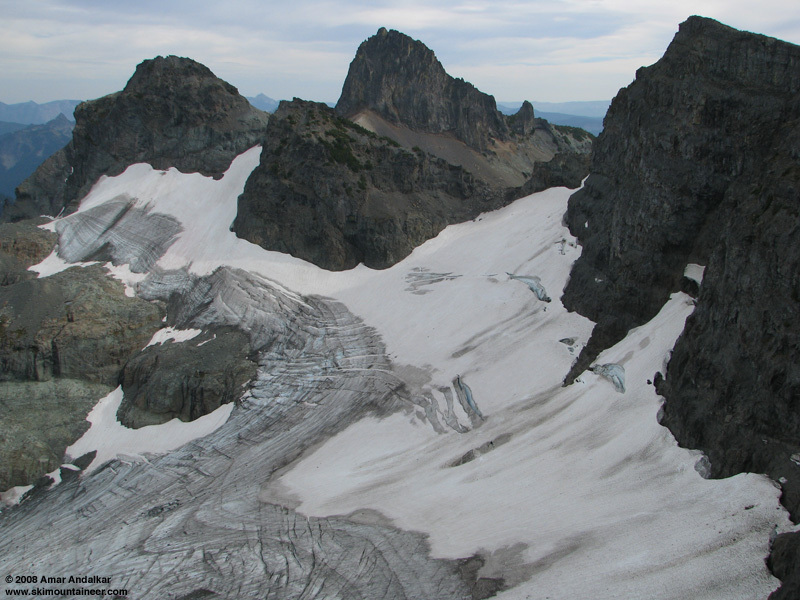 Looking across at the upper Sarvant Glacier in October 2008, with the summit of Banshee Peak at right and the Cowlitz Chimneys beyond. The main reason the glacier(s) still exist at all is their location in an exceptionally well-protected north-facing cirque which lies in a zone of enhanced snowfall extending east from Mount Rainier through Panhandle Gap and on to Chinook Pass, quite unlike the severe rain shadow (snow shadow) area nearby which extends northeast from Rainier through Sunrise and on to Crystal Mountain and Corral Pass. Snowfall and snow depth is more than 2 times greater at Chinook Pass than at Corral Pass only 10 miles to the north, despite Corral's higher elevation, and a similar disparity exists between the Summerland and Sunrise areas, only 4 miles apart. Boot's sweet turns from the day before down a nearby gully. The weather really moved in as we reached the 7000 ft col, which was roughly at the elevation of the bottom of the cloud deck, with periods of foggy whiteout coming and going. 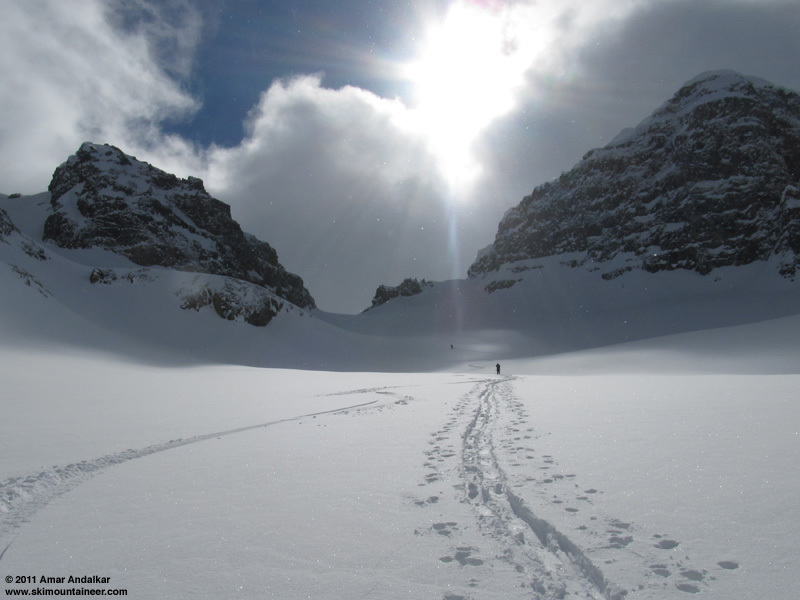 We discussed plans at length, waiting for the faint possibility of another period of sustained sunshine, but in the end we decided to ski back down the glacier. Nice powder on these north facing slopes, still well-preserved 3 days after the latest storm, with no signs of instability. Boot riding down the Sarvant Glacier, aiming to drop below the cloud deck. From the bottom of the basin at 5100 ft, we broke trail up the steep west face of Tamanos Mountain to the 6240+ ft saddle south of its summit, then skied the SE and east facing slopes down to near Owyhigh Lakes at 5200 ft. Lots of suncrust on both the ascent and descent here, with some deep powder to break trail through on the uppermost part of the ascent and also some powder to enjoy skiing lower on the descent to the lakes. By now, it was snowing steadily, but the winds remained very light as they had all day. 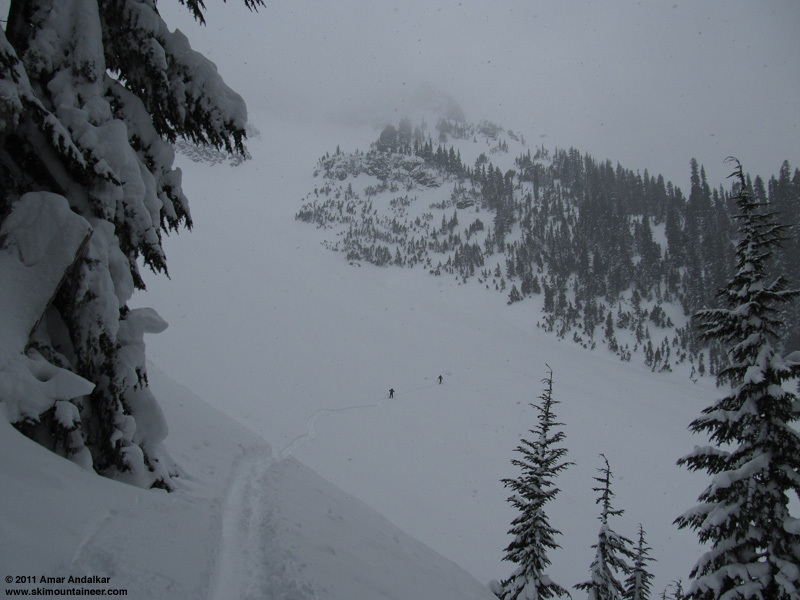 Then back to skinning, traversing up around the east side of Tamanos, through the small lakes basin on the NE side of the peak, and up to the 6100 ft ridge on the north shoulder. I was totally exhausted and drained, carrying my winter weight of 20 extra pounds -- gotta get back in shape if I'm going to keep up with these guys. 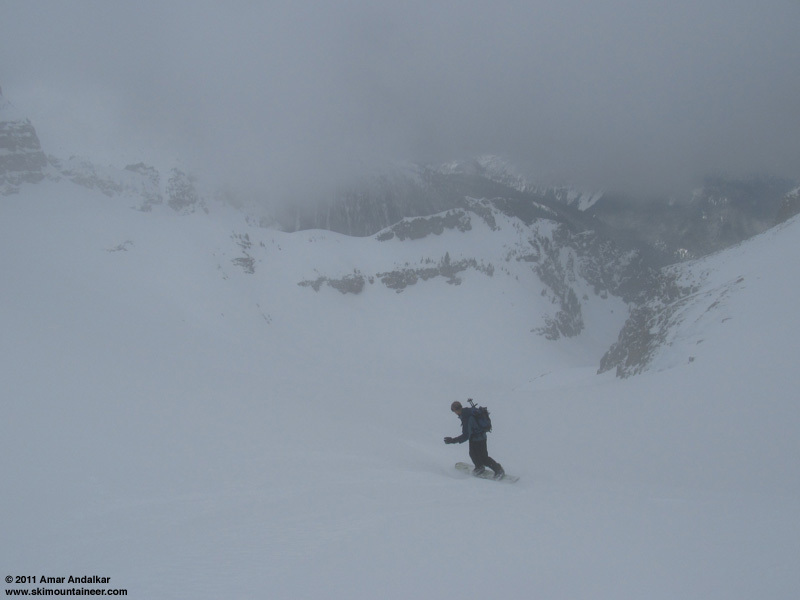 Skinning across the east side bowl of Tamanos Mountain. 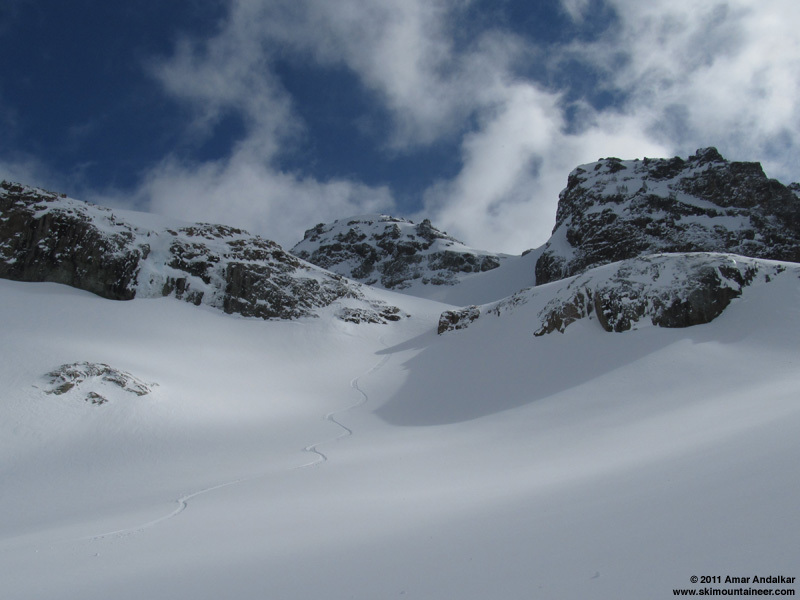 From the north shoulder, several spectacular avalanche chutes drop directly down the 35-40 degree NW slope of Tamanos, all the way down to the flats of Fryingpan Creek near 3900 ft, with over 2000 vert of consistent fall-line. Boot had ridden one of the chutes before, and led the way through the fog, down a spectacular final run, with wonderful stable powder on the upper half, and heavier pow but still good the rest of the way down to the flats. A half-mile traverse through the woods brought us back to the bridge on White River Road where we had started, after sunset as darkness was closing in. Looking down the bottom 1/3 of the chute, with Fryingpan Creek below. It was great to experience this part of the park in winter conditions for the first time, skiing another of Rainier's two dozen plus glaciers, capped by a sweet 2000 ft run to end the day, for about 5700 total vert. Not to mention the thrill of my first ever snowmobile rides -- damn those things are cold, windy, and bouncy! Thanks Boot and Kyle for letting me join you! Topo map of the area: http://mapper.acme.com/?ll=46.87,-121.61&z=14&t=T -- switch to satellite view to see the gullies more clearly. SYNOPSIS...WEAK HIGH PRESSURE WILL REMAIN OVER WESTERN WASHINGTON TONIGHT KEEPING THE AREA DRY. THE REMNANTS OF AN OLD DISSIPATING FRONT ACCOMPANIED BY A WEAK UPPER LEVEL TROUGH WILL MOVE OVER THE AREA MONDAY PRODUCING MOSTLY CLOUDY SKIES AND POSSIBLY SOME LIGHT AFTERNOON SHOWERS. WET WEATHER WILL RETURN BY TUESDAY MORNING AS THE FIRST IN A SERIES OF PACIFIC FRONTAL SYSTEMS CROSSES THE REGION. ANOTHER FRONTAL SYSTEM WILL ARRIVE WEDNESDAY FOLLOWED ADDITIONAL SYSTEMS THROUGH NEXT WEEKEND. SUNDAY NIGHT...MOSTLY CLOUDY. FREEZING LEVEL 3000 FEET. MONDAY...MOSTLY CLOUDY. A FEW SUN BREAKS. A CHANCE OF AFTERNOON SHOWERS. MONDAY NIGHT...MOSTLY CLOUDY WITH A CHANCE OF RAIN OR SNOW. SNOW LEVEL 1500 FEET. TUESDAY...RAIN OR SNOW IN THE MORNING. SHOWERS IN THE AFTERNOON. SNOW LEVEL 2000 FEET. TUESDAY NIGHT...SNOW AND RAIN LIKELY. SNOW LEVEL 2500 FEET. WEDNESDAY...SNOW AND RAIN. SNOW LEVEL 4500 FEET. WEDNESDAY NIGHT...SHOWERS LIKELY. SNOW LEVEL 4500 FEET. THURSDAY...SNOW AND RAIN LIKELY. SNOW LEVEL 3500 FEET. THURSDAY NIGHT...SHOWERS LIKELY. SNOW LEVEL 2500 FEET. FRIDAY NIGHT THROUGH SUNDAY...SNOW AND RAIN LIKELY. SNOW LEVEL 3000 FEET. Those are MY sweeeeet "turns from the day before". I knew you would want complete accuracy . Glad you came along and had a good time. Those are MY sweeeeet "turns from the day before".� I knew you would want complete accuracy� .� Glad you came along and had a good time. I thought Kyle said they were his -- anyway, it's corrected now! Nice work guys and nice write up Amar! A couple summers ago I found myself riding the Fryingpan Glacier and looking at the Sarvant's, wanting to ride but not having enough time for an extended trip. It sure looked good though! Way to get it done - in winter to boot! Amar delivering the goods again. Very cool! 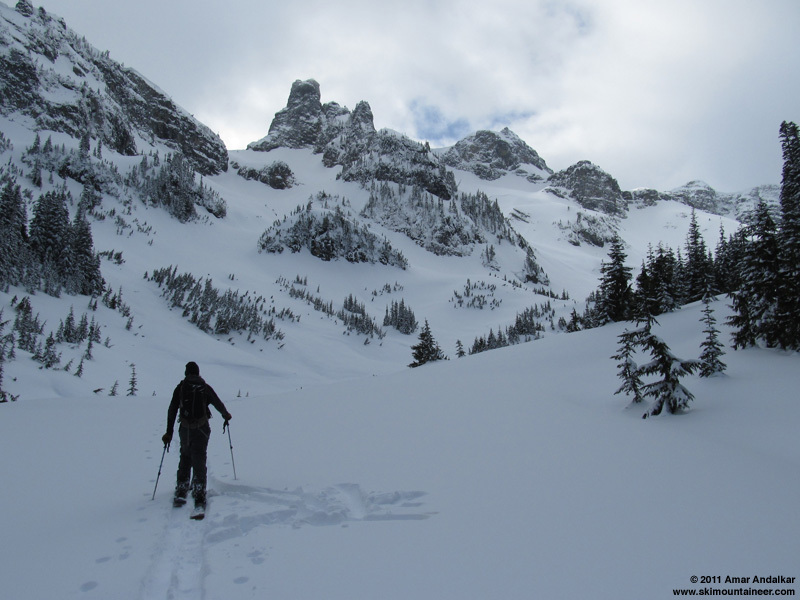 Thanks for sharing a great TR and photos of an area seldom visited by snow sliders.